Wings Spirit: Wild Eastern Phoebe comes to hand! Wild Eastern Phoebe comes to hand! The Eastern Phoebe (Sayornis phoebe) is a loner and seldom comes to in contact with other phoebes and to my knowledge they rarely visit feeders. During breeding season, mating pairs stay together to feed their young. Then return to their solitary life as soon as their young fledged. I noticed one Eastern Phoebe came near my suet feeder in November. However I did not pay much attention to him until few days ago when I tried to refill my sunflower seed feeder. Not only was he not shy away from me, he perched on my deck railing and watched me refill my feeder. After I splashed old water from my bird bath, he was still sitting there and watched me attentively. Now, he got me so interested in him. The first sign came to my mind was this little bird might have a head injury from hitting someone's window. When I looked at him and he then stared back at me. Wow! He was perfectly fine to me and seemed very alerted and smart and had no sign of injury at all. Out of sudden, he flew to suet cake that I put out for woodpeckers and snatched a tiny bite. 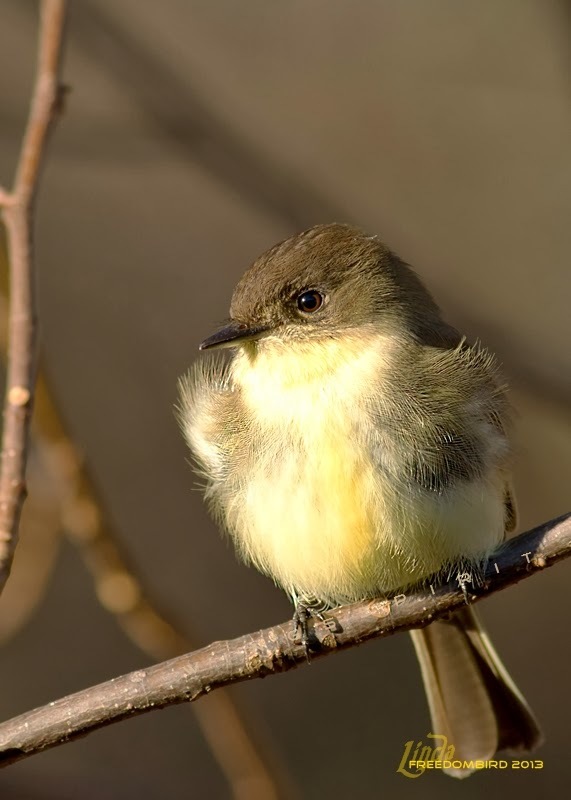 Eastern Phoebe is a tyrant flycatcher, they are insectivorous and snap insects on the wing. Unfortunately he did not get much out of the suet hanging on my deck because he was not capable of landing on top of my free swinging suet feeder. He is a flycatcher! Out of my curiosity, I got one chopstick poked some suet and put on my hand and imagined he might feed from my hand. This mischivious phoebe immediately landed on my shoulder, with my left arm all the way stretching out and holding my smart phone in my right hand, I did not dare to make a move. Overjoyed, I could hardly believe my eyes that a wild phoebe got this close to me and he had no fear what so ever, much like a pet bird... but he is not my pet. He is a happy, free bird, comes and goes as he wishes. At that moment I just enjoyed his company :) For one second, I wanted to name him. But I decided not to. I didn't want to attach myself to him because I'll be so sad if he leaves in spring and not knowing if he will ever return. Wildlife is the happiest when they stay in the wild. Phoebe did not return the following morning and I was sad for a while. It was freezing cold outside with only 24 degree Fahrenheit and I started thinking if he was warm last night...... The thoughts of my worrying dissipated within seconds, "He is a wild thing, he surely knows how to take good care of himself", I talked to myself with a silly smile! Besides, the main functions of feathers not only provide birds important signals to their mates and rivals, they regulate their bodily temperature. In the mid morning, he returned with Tufted Titmice, Carolina Chickadees and brought me a surprise guest, a Harry Woodpecker! He flew around my head for few seconds and when I offered him my hand, he decided to perch on my right index finger! I now have a great new idea for my little friend. Stand by, everyone! Note: If I am busy, he will call me by singing his heart out on my deck. It's hard not to hear his raspy calls.